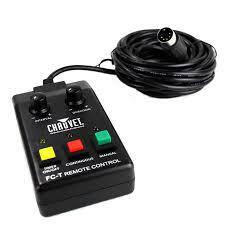 The FC-T is a remote control designed to work with most CHAUVET fog machines. Three LED indicators display timer on/off, continuous fog on/off and whether the machine is ready or heating. Two rotary knobs set interval and duration times.